Citroen’s rival to the BMW 3 Series has since gone on to create its own standalone brand. It’s flawed, but a very affordable way to get some luxury motoring on your driveway. Look all the way back to 1955 and Citroen had the most innovative and luxurious car you could buy – the original DS rocked the motoring world like few, if indeed any, other car and the company is still trying to come to terms with that legacy today. Citroen thinks it should be able to compete with the likes of BMW and Audi on luxury and premium appeal, and the resurrection of DS as not just a model but a series of models (and as of 2015 a brand all by itself) is proof of that ambition. 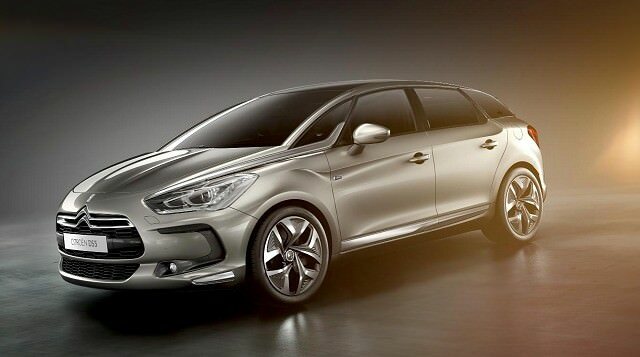 The DS5 is a compact hatchback, designed to be distinctive and luxurious, rather than trying to compete head-on with the likes of the 3 Series when it comes to dynamics and handling. Isn’t it gorgeous? I know, I know – we’re Irish and we’re supposed to think that luxury cars are meant to come with four doors and a separate boot. And a German badge on the back, but come on, even the most curmudgeonly of you must surely admit that the DS5 is an absolutely stunning car at which to look. It’s as much sculpture as vehicle, and earns the right to wear the famed DS badge on that basis alone. Inside, the gorgeousness continues – if Jean-Paul Gaultier were to design the inside of a fighter yet, it would look like this. Even the buttons and switches have a certain Gallic style to them. Switches mounted overhead on the ceiling always add a touch of jet-pilot glamour to a car and the little individual sunroofs for the driver and front passenger make you feel like you’re sitting on an ejector seat. Even that seat is stylish – select the leather option and it comes with sections of leather designed to mimic expensive watch straps. Sadly, that’s where everything comes crashing rather to a halt. Beautiful though the DS5’s interior certainly is, practical it isn't. There’s just not enough space inside, headroom is tight, there are no proper cupholders and the rear seat passengers don’t have anywhere to put their feet. To be honest, it’s a bit of a mess when you start trying to actually use it as a car. At least the engines are good. Mostly DS5s were sold with either the 1.6-litre HDi diesel with either 110- or 115hp, or a 2.0-litre HDi diesel with 160hp – most commonly with an automatic gearbox. They’re both excellent engines, with the 2.0-litre having the edge on both performance and refinement. Both should be pretty reliable too, as they’re commonly used in lots of other Citroens, Peugeots and even Fords and Volvos, but the 1.6-litres especially need to be carefully maintained, and have had good quality oil used at top-up time. You also need to check and make sure that all of the electrics are working properly (and there are lots of electrical components so make sure you have a good poke around) and check the suspension too for untoward noises or knocking sounds. Mind you, DS5s always had a fairly harsh, noisy ride quality at the best of times, so detecting any actual problems can be tricky. Don’t buy anything that doesn’t come with a fully stamped-up service history either. While they’re not great to drive, they are at least affordable. As little as €18k gets you into a facelifted model (on which the ride quality had been improved) from 2012, so you’re certainly getting lots of luxury for the money. Budget on around €19,000 for a 2012 1.6 HDi. The DS5 is a long way from perfect, and an even longer way from being a true competitor for its German rivals. But it’s a beguiling car all the same, staggeringly good to look at and so utterly different from anything else on the road.